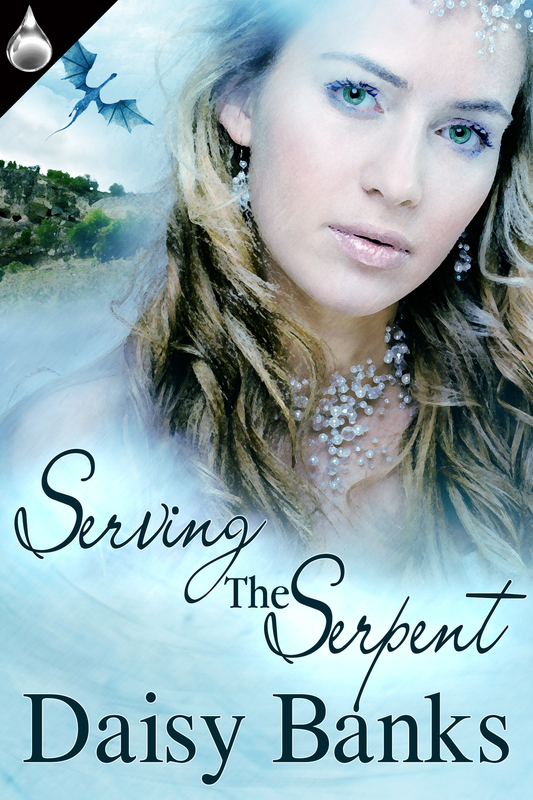 Today, I’m pleased to have my dear friend, Daisy Banks, return to my blog with her latest release, SERVING THE SERPENT, a sweet fantasy romance. I positively love the cover of this book! Just look at the beautiful blending of pastel blues. Isn’t it gorgeous? Oh, and did I mention it has dragons? But, perhaps it’s best if let Daisy tell you about it. . . Thank you for offering to showcase my newest story Serving the Serpent published by Liquid Silver Books on 23rd November 2015. This entry was posted in Book Release, Book Spotlight and tagged Daisy Banks, Dragons, Fantasy Romance, Liquid Silver Books, Mae Clair, Serving the Serpent, Sweet Romance by Mae Clair. Bookmark the permalink. I read Serving the Serpent as soon as it was released. It’s a sweet fantasy tale of love and commitment. The action is two-leveled: the humans and the dragons. I strongly recommend it to fans of fantasy. They will surely gobble it! Thank you so much for such lovely kind words, Carmen. I am thrilled you enjoyed the story. Good to know, Carmen. This is on my TBR and I’m looking forward to discovering the entire tale. Daisy always does such a wonderful job of involving the reader with her characters and in her scenes, whatever the setting! Delightful excerpt, Daisy. Fantasy isn’t my chosen genre and yet, you drew me right in. Wow. You’ve got quite the list of titles to your name. Someone’s been busy. LOL Here’s wishing you holidays filled with good cheer, great food, and magical moments. Would you believe Daisy had four releases this year, plus contributions to a monthly a anthology? I don’t know how she does it, but she is definitely a prolific writer, LOL. Thanks for dropping by to check out her latest, Sue! Thanks for the good wishes, Sue. I hope you have a delightful Christmas. Congrats on your latest release. I’m with Mae, I love the cover! The cover artist really did a fabulous job. Thanks for visiting, Stanalei! I adore this cover by the artist Valerie Tibbs. She has made my covers at Liquid Silver Books and each of them always relates well to the story they are for. Thanks so much for letting me visit, Mae. It’s a pleasure to be here. The cover is beautiful. And I do love a good fantasy. Thanks for sharing, Mae. Best wishes on the release, Daisy. Glad you were able to check it out, Staci. Thanks for visiting, and I’m with you on the gorgeous cover! Thank you for the kind wishes, Staci.I hope you enjoy the story if you read it. Oooh poor sick dragon. Beautiful cover. Congrats, Daisy. Sherry, how lovely to have you drop by and check our Daisy’s release.The Faeries have gone into hibernating in my area until spring, but it’s nice to have the dragons drop by for a visit. And, very lovely to have you drop by, too! I love the beautiful frosting look of the cover. Serving the Serpent sounds like a magical adventure. Good luck, Daisy.